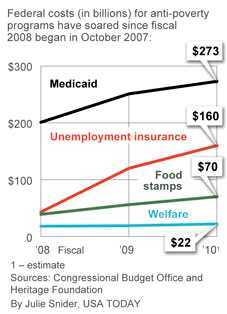 One in Six are in an antipoverty program in the US…. The Fed is dealing with underlying problems by papering them over, which will lead to inflation and economic stagnation. The Fed voted two weeks ago to print as much money as they think is necessary to fight deflation, economic decline, and rising unemployment. It’s a major policy change little noticed by the media. Jobless claims jumped to a 9-month high which forecasts rising unemployment. New manufacturing orders are declining and inventories are rising. Durable goods orders are falling. Credit continues to shrink, both for consumers and businesses. GDP was revised downward for the second quarter. The Consumer Confidence Index took a big slide. Commercial and industrial real estate is still declining. Home sales continue to decline. Some of the leading indicator indices are falling, such as the ECRI and the Consumer Metrics Institute. There was a huge internal fight at the Fed between the anti-deflationists and the anti-inflationists, and the anti-deflationists won. The Fed decided they’d fight deflation through quantitative easing (QE). The second important thing they announced is that they’ll replace their Fannie/Freddie paper with Treasury debt. This seems harmless at first because the Fed isn’t increasing its total debt holdings — yet. They announced this with a seemingly innocuous statement: that they’d keep their current level of debt at about $2 trillion. In Fed-speak this means they’re clearly worried about the sinking economy, and that they’ll print as much fiat money as they think is necessary to increase the money supply to induce inflation. In economic terms, buying Treasury debt is called “monetizing” debt. In plain English it means that the government prints money to pay for its debts. This policy has been the downfall of many governments who destroy their currency through hyperinflation. Look at the nearby chart. It is like a photo of a mountain scene reflected in a tranquil lake. The rises and falls and horizontal meanderings of gold are nearly the negative of the dollar’s. The implication is that gold isn’t a commodity—at least not one that hews to the definition of something that people and industry consume. 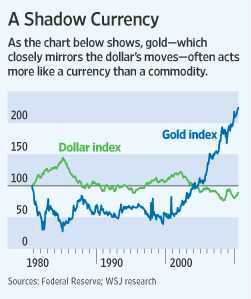 Instead, “gold is a currency” whose daily price is a gauge of the market’s concern about the “potential diminishment” of the purchasing power of the dollar and other paper currencies, says Paul Brodsky, a principal at New York’s QB Asset Management. If, however, you worry the U.S. balance sheet is irreparably damaged, then gold currently reflects the likelihood that a weak-dollar trend still has years to run as the U.S. struggles with its financial mess. Investors—and consumers—looking to preserve their purchasing power will gravitate toward gold, since its quantity isn’t easily manipulated. Invest in gold, then, according your beliefs about the future of the greenback. Just don’t invest based on the idea that gold is a proxy for inflation. You are likely to be played for a fool. There are indeed a lot of changes in the pipeline for individuals and companies. What will happen with tax rates next year? Will capital gains taxes go up? How much? Will dividend tax rates be raised all the way back to the regular income tax rate? What will the President’s deficit commission recommend? A VAT despite Barney Frank’s protestations to the contrary? Will government spending be reduced to close the deficit or will the politicians raise tax rates to try and close the gap? What about accelerated depreciation? If a company makes an investment today will they get to expense it right away or will it have to be depreciated over time? Will health care reform be implemented as written? For that matter do we even know what the rules will be yet? Will the states AGs be successful in challenging the bill on Constitutional grounds? Will it be repealed or changed significantly? What about financial regulatory reform? How long will it take for regulators to write the rules based on the guidelines laid out by Congress? What about the stimulus? Will the infrastructure spending ever start in earnest? Will the tax provisions be extended again? What about unemployment benefits? Will Congress continue to extend them indefinitely? Will there be another stimulus package? If so, will it be tax cuts, direct spending or more grants to the states? Will California, Illinois or the other insolvent states be forced to finally address their structural deficits? What will happen with Fannie Mae and Freddie Mac? Will the administration and Congress enact another foreclosure mitigation program? Will Fannie and Freddie be forced to reduce principal on mortgages? Since 1995 the US dollar index first rose by 50%, fell by 40%, rose by 24%, fell by 16%, rose by 20% and finally fell 10%. Furthermore, the swings have become more frequent recently. The initial 50% rise took 7 years (1995 to 2002; roughly the internet bubble) with never more than a 8% correction. The 40% fall took six years (2002-2008; roughly the housing and commodity bubble) with the biggest countertrend move being 15%. Then during the recent crisis and the aftermath, Fed policy allowed the dollar to rise 24% in 8 months, fall 16% in 9 months, rise 20% in 8 months and finally fall 10% in just 3 months. Dollar volatility is transmitted to a variety of markets that affect business. Rapidly fluctuating commodity prices, interest rates and exchange rates transforms the job of business planning from a difficult one to a nearly impossible one. It raises costs as businesses must devote capital to hedging those risks over which they have little control or ability to evaluate. It affects investment decisions around the world as companies must not only anticipate changes in Fed policy but also how those changes will affect their costs in different countries and currencies. Companies must worry that the Federal Reserve will fail to prevent deflation while simultaneously fearing that they will succeed too well and instead set off an inflationary spiral. With vastly different approaches required for survival depending on the outcome, businesses choose to minimize risks while awaiting the Fed’s next move. The outlook for the economy is indeed unusually uncertain right now but Ben Bernanke and the Fed are the primary source of the anxiety, not Congress. The Federal Reserve is the only institution in Washington that has the ability – indeed the mandate – to provide a stable economic environment. They have failed miserably at both their mandates – stable prices and maximum employment – because they have failed at controlling the one variable over which they have control – the value of the dollar. Democratic leaders were also electrified by a Mark Mellman poll for the Alliance for American Manufacturing, which showed that large majorities believe manufacturing is the most important industry for our economy and national security and support action to revive it. Two-thirds of Democrats, Republicans and independents reject the view that “high-tech and services” industries can replace manufacturing in a strong U.S. economy. When Mellman put a message calling for action to secure our manufacturing base against a conservative line disparaging Big Government and the auto bailouts and invoking the free market, the former won by almost two to one — 60 percent to 32 percent. Deflation? when oil goes from 40 to 140 then falls to 80, the drop from 80 to 79 is deflation?? Since June 1981, when Volker started to lower interest rates from 20% as high inflation rates started to fall, the absolute level of CPI rose 142% to the high in July ’08 (90.5 to 217). Deflation is defined as a decrease in the general price level of goods and services; but, to quantify the current fall in prices, the CPI has fallen just 1% from its all-time high. This tiny price move, notwithstanding we are still near an all-time high in the daily cost of living, has led to talk that the Fed needs to do more to avoid deflation at all costs and thus create inflation via more QE (quantitative easing ). An example, oil goes from $50 to $85 in one year and the next year falls 1% to $84.15 and we’re told there is deflation and deflation is bad. Here’s a thought experiment for all the Keynesian, paradox of thrift adherents out there. If the recession is due to a drop in investment (it is) and savings are required to fund investment (it is) how can a policy of limiting savings (the Keynesian emphasis on increasing aggregate demand) possibly be the solution to our problems? Won’t that just extend the amount of time it takes to accumulate the savings necessary to fund the investment we need to restore growth? Isn’t that exactly the real world evidence provided by the Great Depression and the current Great Recession? At a time when individuals obviously are content to defer consumption until sometime in the future, what gives politicians the right to spend money as fast as their constituents can save it? 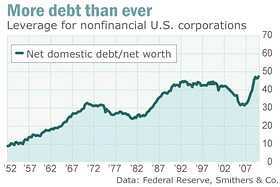 Not cash on sidelines, more debt than ever! Not everyone agrees that manufacturing is vital! The flawed case for manufacturing is embellished by several subsidiary fallacies. Richard McCormack, editor of Manufacturing & Technology News, wrote at the beginning of the crisis: “Without an industrial base, an increase in consumer spending … will not put Americans back to work.” Yet why should the composition of output in favour of manufacturing industries matter so critically for employment creation? Increasing demand for those non-tradeable services that need suppliers and users to be close together – as, for example, with nursing and retirement homes – should have just the same effect on employment. Underlying the current prejudice is the unwarranted presumption that manufacturing industries are technically more innovative than both services and agriculture. Yet agriculture had hybrid corn, the seeds that (at the time of the green revolution) helped growth in developing countries, while genetically modified seeds hold the same promise today. Equally, in services, innovation has transformed the retail and communications sectors – whether at DHL or Tesco. In policy, sometimes Gresham’s Law operates – with bad policies driving away good ones. With no good argument in its favour, a preoccupation with manufacturing industries threatens yet one more example of such a perverse outcome. By promoting manufacturing of all kinds (as can be expected as the sector’s lobbies get down to work) at the expense of more innovative and dynamic service sectors, precisely when America is faltering in its recovery from the crisis, this unhelpful fascination promises to inflict gratuitous damage on an economy that can ill afford new wounds.